Great book. I didn't predict the ending at all which, for me, made it even more enjoyable. Will be reading more in the series. The dead of Crowsmoor are light sleepers. Some say they sleep with one eye open, keeping watch over the restless ones. 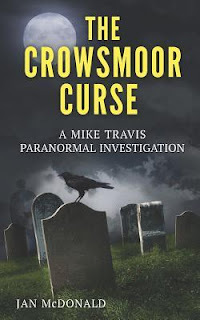 When Beth Trevithick is sent as parish priest to the isolated and scattered community of Crowsmoor, in the middle of bleak Bodmin Moor, Cornwall, she finds a community entrenched in fear and superstition and belief in an ancient curse born of dark magic. She gets unexpected help in the form of Mike Travis, ex RAF helicopter pilot medically discharged after crashing in war torn Afghanistan, he has turned to his other love, the paranormal, devoting all of his time to paranormal investigation. Beth soon discovers the fear and superstition in Crowsmoor are well founded and together with Mike fights for her own sanity and her life.